The secretary at my church asked me the other day if I ever read just for fun. I responded that I read constantly for fun, but most of it is theology. I love reading theology. It's fun. She didn't get that. That is part of why it is surprising that the last two books I have read were novels. I just don't make time for reading novels generally, but for differing reasons, I read Peace Like a River and The Shack in April. Here is my review of the former, and I'll get to the latter next time. I first got turned on to Peace Like a River when I was dating my wife. She is a much more literary-minded person than I and was reading it with our good friend Teresa. Teresa actually has her degree in English, so their combined glowing recommendation peaked my interest. Then J. T. posted this quasi-review by Piper. All that to say that I was thrilled when my wife bought it for me for Christmas. While I don't think that Piper even picked the best quotes from the work, he is on to something even with the title of his review: "Not Heartwarming Christian Fiction." Since my background is not in literature, I lack the language to describe to you both how good this book is and why it is so good. But it is. 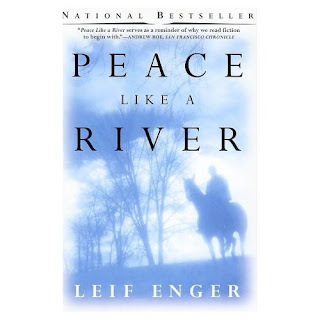 Peace Like a River is incredibly well-written and it asks great questions, without making the standard Christian fiction mistake of answering them all for you. For that matter this book doesn't read like Christian fiction at all, probably primarily because it isn't bad. Whodda thunkit? Let me say something about that word: miracle. For too long it's been used to characterize things or events that, though pleasant, are entirely normal. Peeping chicks at Easter time, spring generally, a clear sunrise after an overcast week - a miracle people say, as if they've been educated from greeting cards. I'm sorry, but nope. Such things are worth our notice every day of the week, but to call them miracles evaporates the strength of the word. Real miracles bother people, like strange sudden pains unknown in medical literature. It's true: They rebut every rule all we good citizens take comfort in. Lazarus obeying orders and climbing up out of the grave - now there's a miracle, and you can bet it upset a lot of folks who were standing around at the time. When a person dies, the earth is generally unwilling to cough him back up. A miracle contradicts the will of the earth. My sister, Swede, who often sees to the nub, offered this: People fear miracles because they fear being changed - though ignoring them will change you also. Swede said another thing, too, and it rang in me like a bell: No miracle happens without a witness. Someone to declare, Here's what I saw. Here's how it went. Make of it what you will.